The painting of 7 aircraft from the last 100 years of 7 Squadron which was presented to the Squadron from the Association at the RAF Club on 3 May 2014. The Painting shown above was painted by Malcolm Reeves an Associate Member of the Guild of AViation Artists. 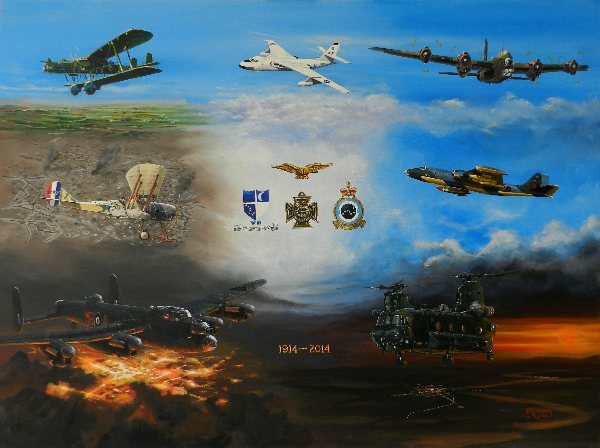 It is painted on a stretched canvas using acrylic paint and represents 7 Aircraft from the history of 7 Squadron. The RE5 shown depicts that flown by Capt J A Liddell MC on the sortie during which resulted in the award of the Victoria Cross, Liddell's right thigh was shattered and the aircraft seriously damaged, despite this Liddell recovered the aircraft safely saving the life of the Observer. Liddell later died of his wounds. The inter-war years is depicted by the Handley Page Heyford which operated from Worthy Down in Hampshire. The Short Stirling was the RAF's first four-engined Bomber and No 7 Squadron was the first Squadron to operate the type initially at RAF Leeming then from RAF Oakington. The Avro Lancaster became the backbone of RAF Bomber Command and 7 Sqn converted to the type in 1943. With the Nuclear-era the RAF invested in three V-Bombers the Vulcan, Victor and the Vickers Valiant which the Squadron was equipped. As operations changed form High to Low-level the weakness of the main-spar in the Valiant forced its early retirement from service. Following seven years of inactivity the Squadron reformed as a Target Facilities Squadron operating the superbly adaptable English Electric Canberra becoming one of the RAF's largest Squadrons. Finally, bringing the Squadron up to date whe have the mighty Boeing Vertol Chinook tandem-rotor helicopter. The Chinook has proved to be a battle-worthy design which has provided the Squadron with a superb platform to truly operate "By Day and By Night". In the centre of the painting is a depiction of the Victoria Cross as awarded to Capt Liddell, flanking it are the inter-war, unofficial Squadron Badge and the present Squadron crest approved by King George V. Summounting these is the "Pathfinder Badge" awarded by AVM Don Bennet AOC No 8 Pathfinder Group to crews once they had completed their Pathfinder training. It is hoped that fine quality prints of the painting will be available shortly. STOP PRESS.....See "Association Shop" pages for details of prints.